'before-during-after' snaps.... these will then be yours to keep! These are submitted in your emails - and free of charge. Photos are very valuable if ever you sell your piano at a later date. We can also provide a slideshow, video or some extra special graphic photos at your request. Please ask for a quote. We have a team of experts to handle your piano very carefully, should your piano need to be taken away for a short period. During any routine call to your home or premises, we will with pleasure give you some information about your piano (if you are interested), should you be a novice and want to learn more. 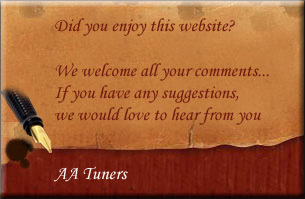 We also provide on-the-spot free advisory notes should we spot any future problems with your piano - that may be sorted out at a later date. This is similar to a MOT vehicle advisory note following its test. Advisory notes are purely for your peace of mind and FREE. We provide free-first time on-site quotations for repairs, refurbishments and restorations within a certain area. Should you request for an updated quotation at a later date for the same instrument, upon agreement of a restoration, we will fully refund any call-out charges for subsequent visits. If you require our services outside a 'reasonable' distance, all we ask is that you cover the cost of our travelling expenses. (Refunded upon accepting a restoration). Depending on the name, age and condition of your piano, we can also provide an on-site valuation should you wish to sell your piano. 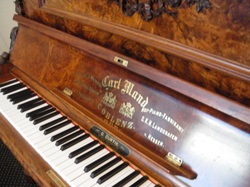 We also provide on-site 'estate piano' valuations, should a family lose a loved one. We will gladly provide an assessment for probate on their behalf or for insurance purposes. What ever service you require, feel free to contact us at any time.